The collection of the late Daphne Foskett (acquired prior to 1963, coll. No. 112); Thence by descent. This portrait has been taken from the popular full length oil by Thomas Gainsborough (1727-88), commissioned by George III and hung at the Royal Academy in 1781. 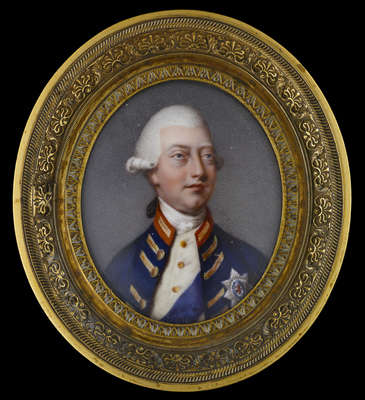 A version of this portrait survives, in an aristocratic private collection, suspended from a chatelaine and given by George III to Elizabeth, Countess Harcourt. Enamels such as this were usually presented as gifts to family and friends or visiting dignitaries, with versions still extant in the Royal Collection. Hurter was born in Schaffhausen but by 1777 was settled in London, exhibiting at the Royal Academy between 1779 and 1781. After this he travelled widely in Europe, returning to London in 1787 to set up a factory for mathematical instruments. He then travelled back and forth between his native Germany and England, being employed by Catherine the Great in 1787 and enobled by the Elector Karl Theodore in 1789.